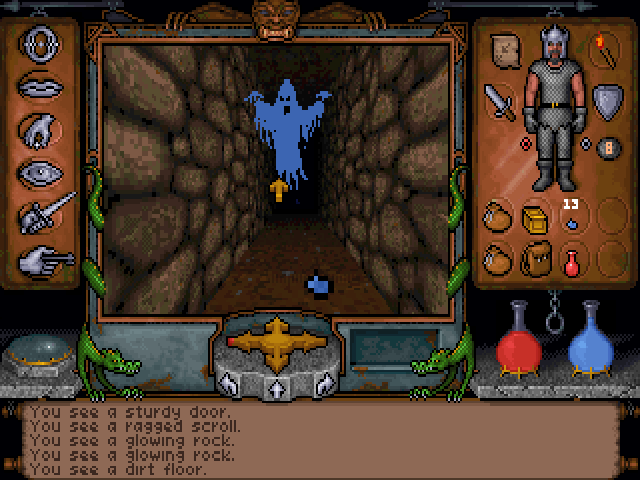 Dungeon crawling was the dominant first-person genre in the 80s, for understandable reasons. It was simple visually, and an easy environment for a designer to control. Random generators in the style of Rogue could create an endless variety of catacombs to explore with little effort. And thematically, it was popular – players could get excited about “being there” whilst creeping into the forever unknown depths of a labyrinth like Tolkien’s Moria. Dungeon Master, Wizardy, Might and Magic, and SSI’s “gold box” series (usually based on the lore of AD&D) are all popular examples. 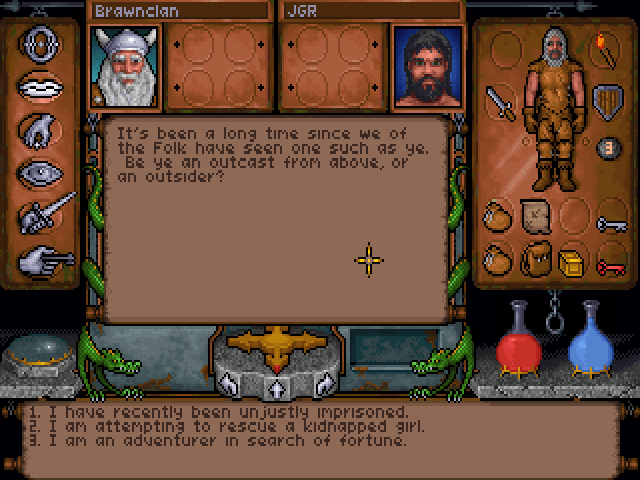 Even the Ultima series itself started you off plumbing the stinky halls of Britannia’s crypts. Underworld’s contribution to both the RPG and FPS genres is now the stuff of legend. The ones that weren’t played from an overhead perspective all had the same first-person style in common. 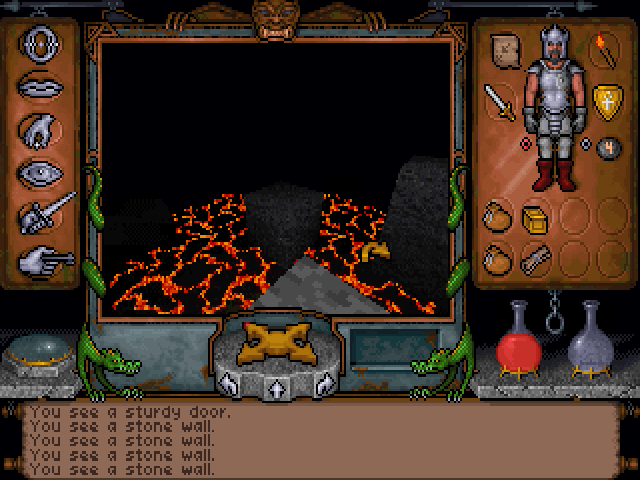 The world was broken into 90-degree views, and you navigated using cardinal directions – the same as from the interactive fiction days of Zork. Newly-formed development team Blue Sky Software set out to create something in full 3D and thus, in their words, the best dungeon game ever made. Showing off a demo of their 3D engine as early as 1990, they caught the attention of Origin as a publisher (and allegedly, John Carmack, leading to Wolfenstein 3D), added in some connections to the venerable Ultima series, and released their masterpiece in 1992. It was, indeed, the greatest dungeon game ever made. My distaste of all things fantasy and “Ye Olde English” should be legendary by now to regular readers of the site, so it will come as no surprise that I have absolutely no experience with this title or any of its contemporaries. I walked into the Stygian Abyss cold. For those who need a little more grounding, Underworld is most directly tied to Ultima IV, which introduced the series’ system of eight Virtues, as well as the Stygian Abyss itself. In Underworld, you return to the Abyss after some time has passed. A man named Cabrius tried to unite all the creatures of Britannia in a utopian society within the Abyss’ caverns. His experiment failed. 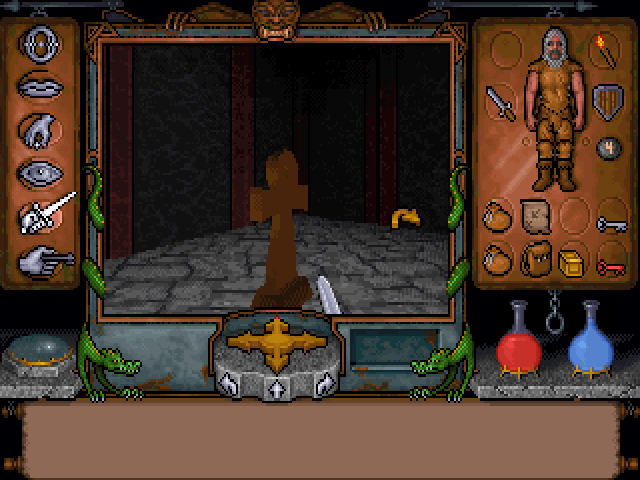 While you’re initially sent in to rescue the local Lord’s kidnapped daughter, you’ll ultimately have to recover eight objects representing the Virtues to defeat the true evil lurking on the lowest level. What struck me most after spending some time with Underworld was that this wasn’t the hack-n-slasher I thought it was going to be. 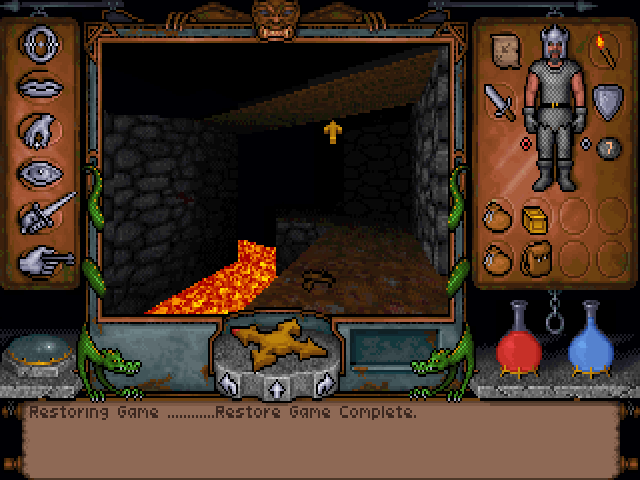 For some reason, I had the impression that these 80’s dungeon crawls were something more like a first-person Diablo – you’d simply wander around levels, bash things with a sword to get better at bashing things with a sword, all the while looking for awesome gear to loot and the stairs to the next level. This is not the case. Underworld’s factions have grouped into colonies within the dungeon’s levels, and you’ll interact directly with NPCs to get information and side quests. There’s some politics going on. There’s history to uncover. I think it may actually be impossible to complete the game without the help of your fellow man (or goblin). Stealing and random violence have consequences. It’s, well, a proper RPG. Careful what you say. Aside from the obvious insulting options, some NPCs will respond better to certain tones. This means a slant toward realistically modeling the world and its effects as well. You can get hungry and tired, with damage to your health if either is neglected (don’t worry, the time limits here feel realistic). Potions and mushrooms are found unidentified. If you can’t identify them, you can only opt to drink ’em down and face the consequences. Factions have memories of your interactions with them, and will rush to defense of their comrades if you attack. Locked doors can be physically beaten down, at the cost of weapon wear. And crucially, everything has weight. You simply can’t wear plate armor and cart around a bunch of extra torches, food, keys, and unidentified objects. I originally played as I usually handle an RPG; picking up everything and trying to convert it to stockpiles of gold through trade. Well, gold has weight here too, so this policy was abandoned a few levels in. Character creation and progression appear as well. There are a number of archetypes to choose from, which only give you a boost if you have a clear character path in mind (magic user versus sword and shield). 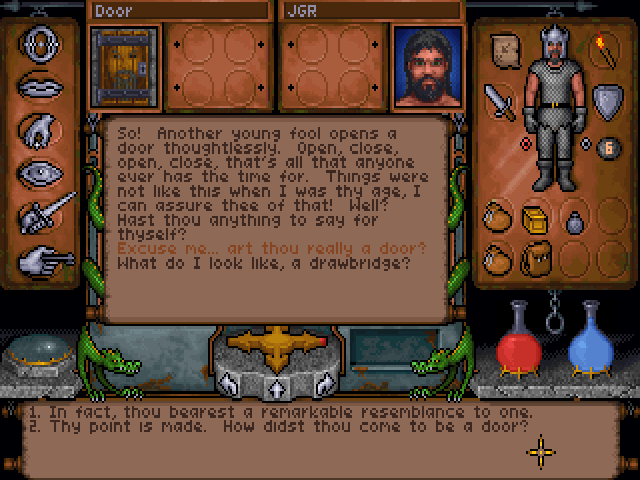 Skills are what really define your character, and include Search (to find hidden doors), lockpicking, swimming, barter, specific weapon specializations (mace, axe, sword) and many more. Skills are boosted by typing “mantras” at shrines. You get two boosts per character level, and are limited only by which mantra words you have learned through chats with NPCs or notes found on the ground. Any character can specialize in anything with the right mantras, but it helps to follow your class and your rolled Strength, Intelligence, Dexterity scores, as these three attributes also affect your skills’ success. Magic is handled with a system of runes. These are physical objects carried in a special rune bag (assuming you find it), and each rune represents a word. You assemble a spell using these words, again either taught by NPCs or discovered through experimentation. While fireball spells and similar attacks do exist, most of these are alteration spells – things like showing enemy locations, slowfall, magic armor, flight, or creating food or light. 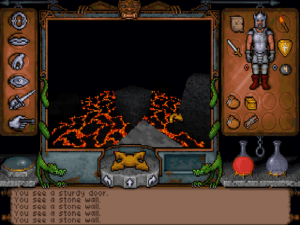 Higher level spells require your character to be at a certain level to cast them at all, and spells do have the ability to fail or even backfire. While it’s possible to beat the game without magic, in general, magic makes everything easier – hunger management, backtracking, travel and exploration, and it even negates the need for torches – so a balanced character is probably best. The engine allows for ramps, jagged terrain, and bridges. Of course, you can’t talk about the game without talking about the engine. It’s light years ahead of anything at the time, surpassing even Doom in many respects. You can look up and down with the 1 and 3 keys and jump with the J key. There are bridges over paths, ramps going up and down, a wide variety of platform heights, and some pillars that can be manually raised with switches. Doors open in and out instead of simply sliding into the walls. Walls are not restricted to 90-degree angles. There’s textures for both the floor and ceiling (with the option to disable for slower machines). While you never see another light source, the light radius around your character changes based on spells or lit torches, with the rest of the world fading into suitable darkness. Stumbling around without light is possible, but not advised. There’s also a limited physics system, so thrown objects bounce off walls or enemies. Even the occasional 3D polygon bench or barrel makes an appearance. The engine also aggressively keeps you from clipping, and will snap your view (or direction) parallel to a wall if you bump up along it. You can adjust to this over time, but it makes simple navigation, especially on corners, more of a chore than it needs to be. Jumping is by far the worst system, with some later-level jumping puzzles or hazards that I’m not sure should have been implemented at all. You have no direction control in midair, and if you’re just a few inches off in your trajectory, you’ll hit a wall and be at the mercy of the physics system. Apparently you have no weight, and so will pinball off any walls while taking damage from the fall – assuming you don’t just fall into lava waiting below and end it right there. Save before every jump. No, really. Every jump. Go right to hell, jumping puzzles. You are the worst. Puzzles exist as well, and are both brilliant and dastardly. They’re brilliant in the sense that it seems like every one of them has an NPC that will give you the clue or directions needed to pass if you’re simply polite. These can range from the right position of levers, where to look for a secret door, or a critical step such as the puzzle where you have to avoid the center of the room while you solve it. They’re dastardly in the sense that I didn’t always find that knowledgeable NPC, and wandered aimlessly because of it. As one example, I found a tailor, I was previously given some dragon scales, but no one ever told me I could put those two together. This meant when I came across lava floors in a later level, I had no idea those scales could be turned into helpful boots. If something’s not making sense, you absolutely should backtrack or explore elsewhere, but I certainly see moments where even dedicated explorers might need a walkthrough. There’s combat, of course, but it doesn’t seem to come up that often. Aside from what appear to be a few randomly-spawned stragglers, when you clear an area, it stays cleared. Entering combat mode brings your weapon up at the bottom of the screen. You have three attacks, based on whether your cursor is in the top, middle, or bottom of the screen. I’m not sure if certain weapons are best at certain attacks, but I could see how a sword would be stronger at a thrust while an overhead smash befits an axe. You’ll need to “charge” each strike by holding the right mouse button. Releasing when a gem to the left is green puts your full power behind it. AI is limited, but will try to run when near death, or fight to the end when cornered. Weapons degrade with use and can either be repaired by a smith (or you, with the proper skills and an anvil), or replaced entirely by found gear. The interface seems designed with full mouse control in mind. Your cursor changes to arrows at the edge of the screen, and holding down the left mouse button moves you in that direction. There’s a nice analog nature to it as well, with your speed ramping up as you move closer to the screen edge. You can even manage moving in for strikes and backing off during combat, while separately holding the right mouse button for your attacks. You have the option to click into distinct “look,” “talk,” “use,” modes, but it’s far simpler to hold the right button and swipe left or right. The appropriate action is automatically used. If you want to use the keyboard, you can, with what may be the first implementation of the WASD setup. There’s even buttons to click to move in 90-degree sections, to appease the dungeon crawling faithful. Uhh… it’s cool everybody! I got this! Finally, I have to mention the brilliant automap. Not only does it fill in as you explore, it also lets you type notes anywhere upon it. You can leave hints in the margins, mark notable locations, or copy the contents of notes and toss the paper from your inventory. 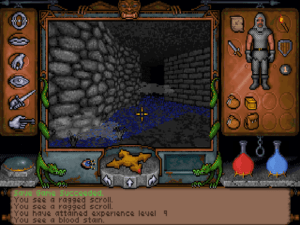 The game’s eight levels are treated as one continuous dungeon, so you’ll be doing a respectable amount of backtracking to previous levels. The map and your notes make it infinitely easier to remember where you need to go, or to find your way out of the game’s many late-level mazes. I doubt I could have played the game without it, and the ability to take notes without a separate, physical piece of paper was a wonderful added bonus. So how does it all ultimately play? Exceptionally well. Again, I speak as someone without much experience in the delving of dungeons, but the lure of exploration comes across almost perfectly here. There’s always something to find, and progress in filling out the map is always being made. NPC conversations are almost always helpful, or barring that, provide some decent humor. I particularly enjoyed the quests investigating a goblin’s toilet (oh, yes) and a maze run collecting pellets that parodies Pac-Man. About the only point the fun fails is when you’ve exhausted your list of known contacts and still don’t have an idea how to proceed. 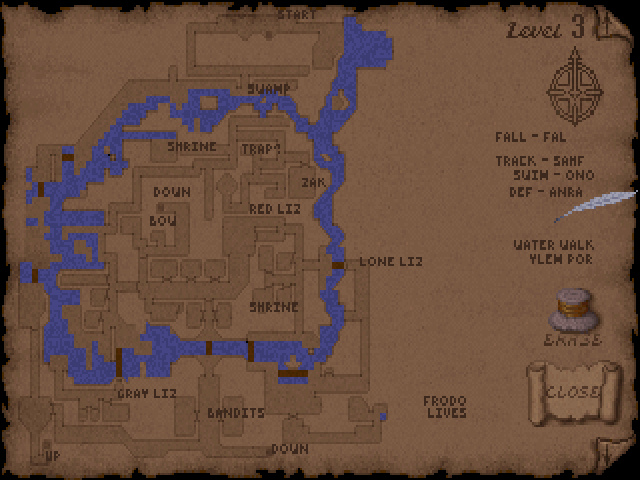 It usually then comes down to a matter of examining unfilled areas of your map for possible hidden doors, or heading down passages of rivers or lava you can’t easily traverse (flying and water walk spells help immensely here). If Underworld sets out to make exploring a dungeon fun, it’s got enough hooks to pull that off successfully. It’s realistic enough to inject some consequences and considerations into your travels, you get a real sense of “getting better” as your character progresses, and all challenges can be bested by making friends with the locals. Its engine was, simply, a revolution, and the list of games and series it inspired is distinguished indeed. I hesitate to recommend it to any and everyone, because there’s not much here to impress a generation introduced through the later Elder Scrolls games. But if you’re interested, there’s a lot more depth here than you might expect, and a real sense of exploration to enjoy. An engine and design that would influence most RPGs that followed. NPC interaction feels believable and creates impromptu side quests. While there are only 8 levels, they’re all hand-built and smartly populated. Some pretty tricky puzzles that still make you feel clever solving them, even when a friendly NPC essentially just told you what to do. Jumping is pretty awful, especially when they ask you to hop through narrow gaps or over deadly lava. Cabrius’ items are hidden well, and it’s not always clear what to do next. The nature of the skill and magic system mean you may discover useful chants a little too late, or even not at all. Great review and when Arena came out from Bethesda Softwroks, the first Elder Scrolls game, little did people realize what greatness that series would become (also buggy and huge open world greatness too). 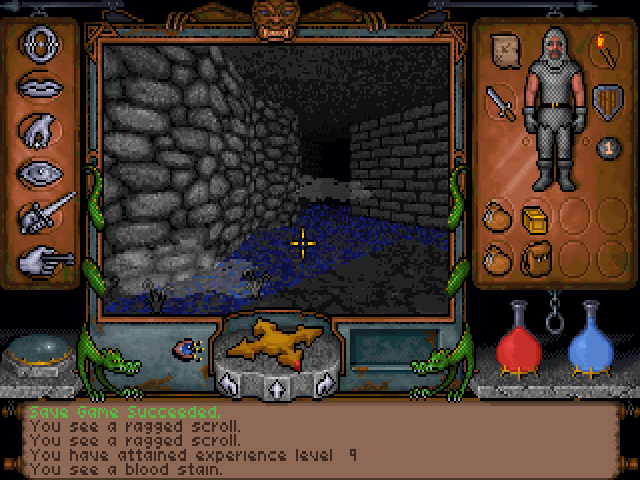 Ultima Underworld was a technical marvel at the time and a pretty good game overall. I wouldn’t rate it 5 Stars though. Looking back i think Ultima 7 was the better RPG and Wizardry 7 had a better story but it’s still good. I considered a lower score, mostly for the jumping and the confusion. But I wanted to see it through to the end, wanted to come back each session, and ultimately enjoyed it about as much as System Shock. High praise for a genre (fantasy) I don’t really get excited for. Ignorance may have also helped, but nothing prevents other Ultimas or Wizardrys from getting 5 stars too. I’d like to get to Arena sooner than later, but we’ll see how it pans out. Nice Review! You almost have me convinced to give this another try, though I failed miserably to get into it the first two times. 😛 The funny thing is that this would be exactly my kind of game and I thought the rather obscure classes like the sheperd sounded really cool… but I just couldn’t get over the graphics and the awkward controls.